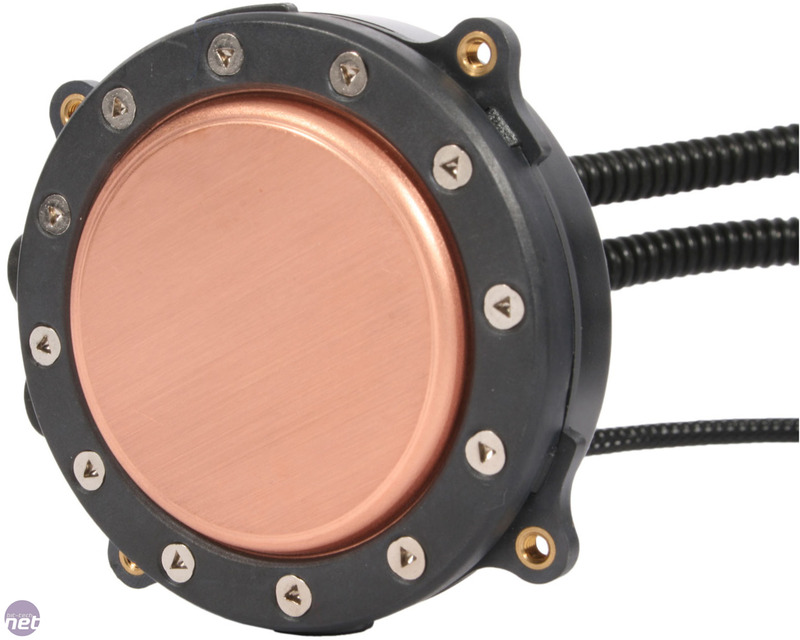 When news first dropped about Cooler Master jumping onto the cooled-loop-cooler bandwagon with the launch of its Seidon 120M liquid cooler, one thing about it immediately jumped out to us. 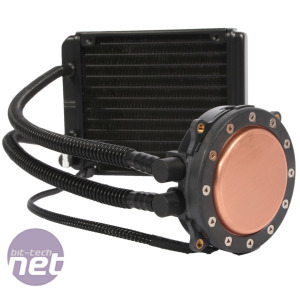 The fact that the cooler is manufactured and designed by Cooler Master itself is a refreshing change from the sea of rebranded Asetek and CoolIT models we're so used to. Other coolers like the Corsair H40, which we've not had a chance to look at yet, are available for a similar price, but the Seidon 120M's unquestionably affordable; at £48 it's the least expensive cooler of its type we've seen and among the cheapest on the market. It's almost £15 cheaper than the admittedly overpriced Thermaltake Water 2.0 Performer and a whole £30 less than the excellent Corsair H80i we saw recently too. While it clearly has a distinct advantage here, it will still need to effectively compete with similarly priced air coolers in order to be a worthwhile purchase. Although keeping the design in house will have allowed Cooler Master to lower the price, other cost cutting strategies are also in effect. 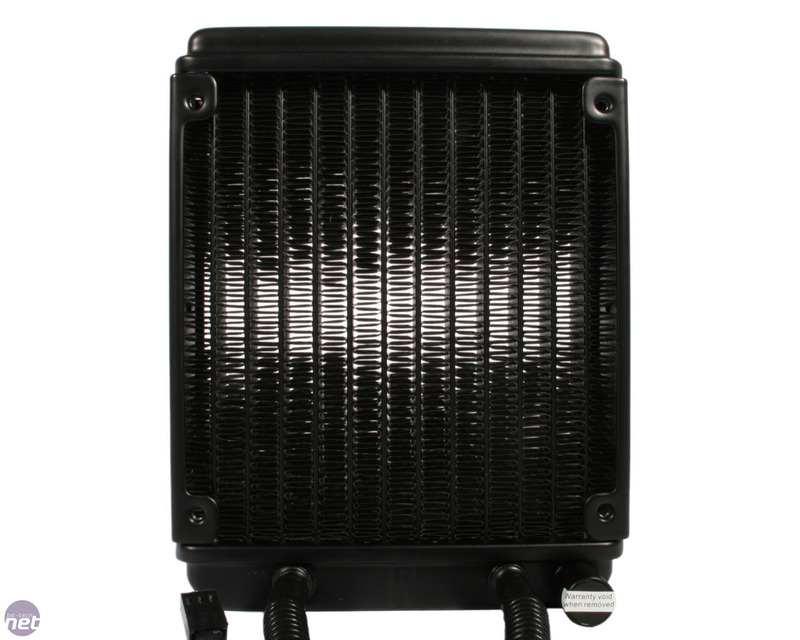 For starters, the Seidon 120M comes with just a single 120mm fan, rather than the more common two, although it does support a second fan should you have one. 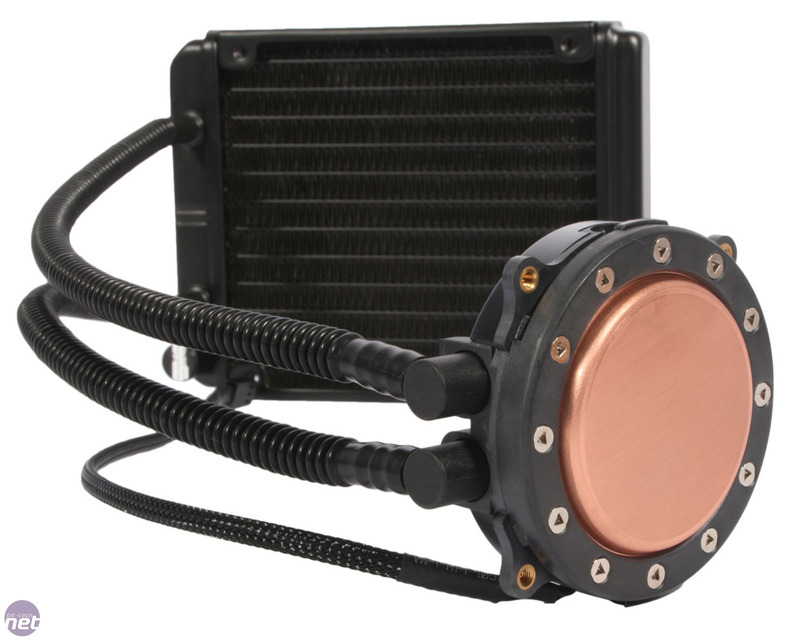 The 120mm aluminium radiator is also very thin at just 27mm wide, and likewise the CPU block is low profile and the plastic tubing skinny. That said, it feels well constructed all over, and unlikely to fall apart any time soon. 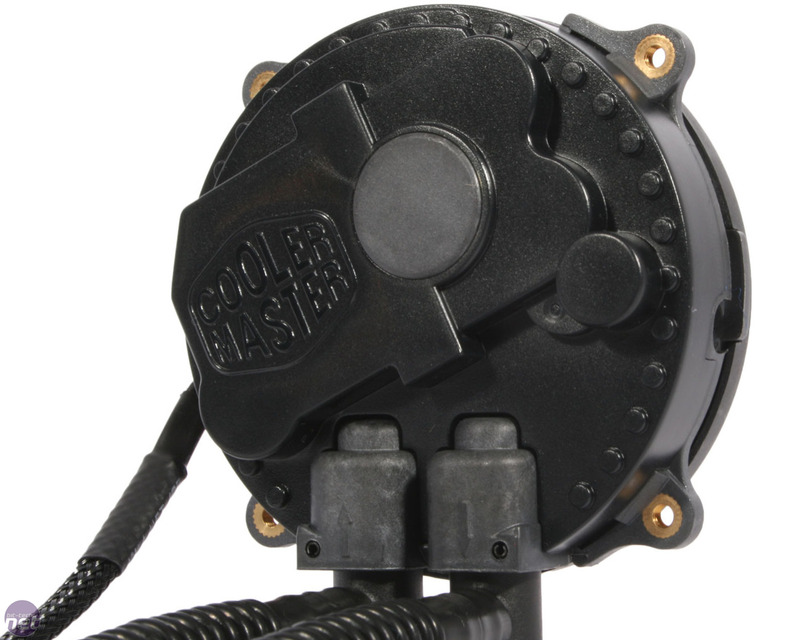 As is common with coolers of its type, the waterblock is constructed from a single block of copper. Meanwhile, the radiator sports a very dense set of fins which will help maximise the available surface area for heat dissipation. 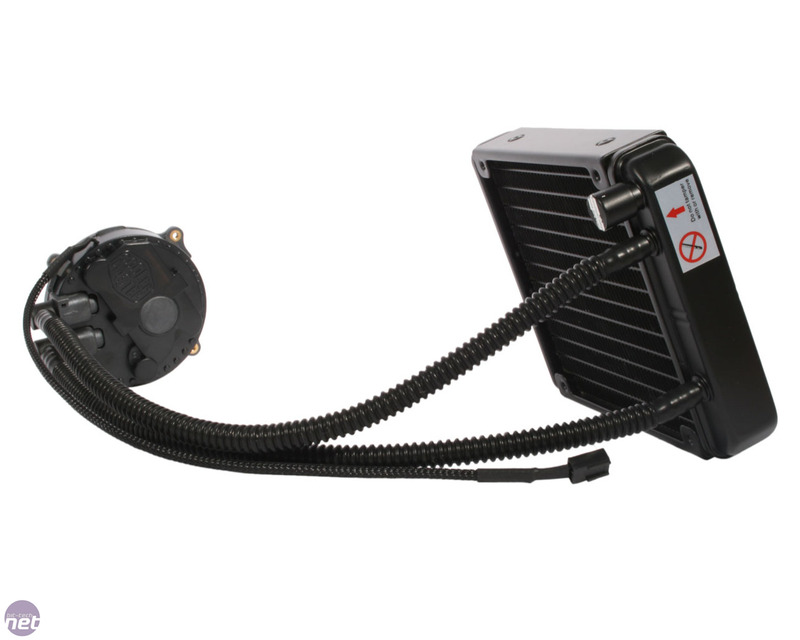 You won't find any included fan control with the Seidon 120M; instead the single fan is PWM controlled with a wide range of 600-2,400 RPM. Aesthetically, it's nice to see that the fan and pump cable are both nicely braided in black, and the single blue LED on the CPU block may also be of appeal to some. Two pairs of mounting plates (one Intel, one AMD) with pre-attached spring loaded screws are provided and screw directly onto the baseplate. 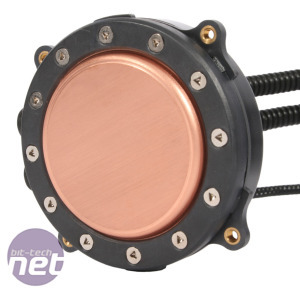 Intel sockets other than LGA2011 require the use of a supplied backplate, onto which standoff nuts are attached to receive the spring-loaded screws, whereas the AMD mounting plates screw directly into the standard AMD backplate. It's not as elegant a mounting procedure as that of the H80i, but it's still one that's simple, quick and secure. One tube of thermal paste accompanies the cooler, and was enough to refit the Seidon onto all three of our test system mounts. 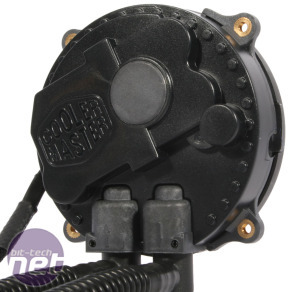 Strangely, the manual specifies in the installation drawings that the single fan should be mounted as an exhaust fan pushing air over the radiator, whereas this video from Cooler Master suggests that an intake setup is better. We have therefore tested in both configurations. 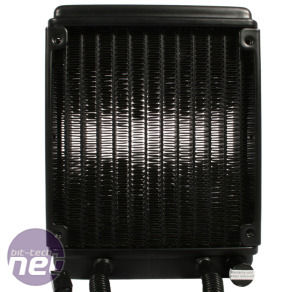 However, we were frustrated to find that the radiator's top and bottom tanks mean that even though it has 120mm mounting holes, it is actually larger vertically than a standard 120mm case fan. As such, we were unable to align it fully in the rear or even in the roof mount of our test chassis, and had to resort to sticking the radiator in place for the exhaust test rather than using screws. This is more a limitation with our chassis rather than the cooler, but it's something to be aware of if you're planning to fit the Seidon into a confined mount. Jury finds infringement, demands royalties. 'Room for improvement,' company admits.